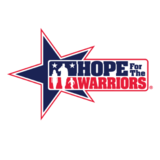 FLOC is having a great event to raise awareness for Hope For The Warriors and being an office of one...I need your help! We will be doing a 50/50 raffle and drawings for Starbucks gift cards and some wine. Who doesn't love those?! I'm looking for a few volunteers to help me rally people to buy raffle tickets! Thanks for your support!